The weather gods have ordered rescheduling. Tonight (August 3rd) at the Hatch Shell. The augury of the weather gods seeming providential, Boston Landmarks Orchestra, soloists, and chorus will resound across the Boston Esplanade with the glory of Beethoven’s Ninth Symphony. At 7pm August 2nd, music director Christopher Wilkins lead the early-19th-century journey from darkness to light, affirming Beethoven’s belief in music’s power to redeem suffering humanity. Preceding the Ninth at the free concert will come the composer’s music to Goethe’s play ‘Egmont,’ about resistance to tyranny, and the sweetly lyrical Romance in F Major for violin and orchestra, with soloist Adrian Anantawan. When Beethoven unveiled the Ninth Symphony to an eager Viennese audience in 1824, he had not written a symphony in nearly twelve years. It was an historic occasion attended by the leading figures of Viennese society even though public taste had long-since turned away from the complexities of Beethoven’s music toward the more easy-to-digest style of Rossini. Beethoven was not on board with the trend: “You do not know how to deal with real drama,” Beethoven reportedly told Rossini to his face when they met in 1822. Real drama for Beethoven meant “to front only the essential facts of life,” including its philosophical, political, and ethical dimensions. It meant contemplation of the sublime, and reverence for the divine. It did not mean writing music to fill a few hours with pleasant diversion. Beethoven wrote music to be listened to, and on his own terms. Tonight’s program contains works from what are commonly referred to as the three periods of Beethoven’s output: early, middle, and late. The Ruins of Athens is not a late work, despite a high opus number. It was composed in 1811, the same year as his Seventh Symphony. The Turkish March—with its colorful use of Janissary percussion (bass drum, cymbal, triangle, and switch)—is familiar to many who have little experience with classical music. When he settled in Vienna at the age of 22, Beethoven studied counterpoint (with Haydn), violin (with Schuppanzigh), and Italian vocal style (with Salieri). Evidence of all three disciplines appears in two diminutive and exquisite solo works, the Romances for violin and orchestra. Although the Romance No. 2 in F was the first of the two to be composed—around 1798—it was the second to be published. The sweetly lyrical melody of the opening could only be by Beethoven. It is an early example of what Hans Gál described as “absolute melody”— a tune with “broad rhythms, eight-measure groupings, and clear melodic curves.” This melody returns twice in the course of the work, after contrasting themes and keys are explored. It is unusual to have as soloist someone who has been a close partner to the Boston Landmarks Orchestra for many years, but in a different capacity. Adrian Anantawan served as teacher and conductor at the Conservatory Lab Charter School for many years. In that role, he has collaborated many times with us as the conductor of that school’s Dudamel Orchestra. This fall he assumes a new position as director of the orchestral program at Milton Academy. We warmly welcome Adrian tonight He is one of the outstanding violin soloists in our region. Beethoven’s middle period is sometimes referred to as his ‘heroic’ period because of several works that suggest heroism, recue, or apotheosis. The ‘Eroica’ Symphony—originally called by its composer the ‘Bonaparte’ Symphony—is the clearest example. Also included in this group are the Fifth Symphony and the incidental music to Goethe’s Egmont. Beethoven was ecstatic to write music accompanying Goethe’s historical drama. The play reflected his own values, and mirrored political events as he saw them in his own day. Goethe’s Egmont extolled a man who sacrificed his life in order to take a public stand against oppression, a theme Beethoven had already explored in Fidelio. Beethoven was especially pleased to write two songs for a soprano he admired, Antonie Adamberger, in the role of Egmont’s lover, Clärchen. The first of these songs is a march featuring piccolo and timpani to represent fife and drum. Goethe’s play followed the five-act model of Shakespearean tragedy. Other than the overture, most of the incidental music that Beethoven provided came in the form of entr’actes. Entr’acte IV preceded the tragic end of the hero and his lover. Following the completion of the Seventh and Eighth symphonies, Beethoven’s output slowed considerably. He had been beset by personal worry and illness, and his works took longer to produce, as he was writing now with greater depth and imagination. He had entered a new phase in his creative life—his “late period.” His music sounded other-worldly, untethered, irrational, and puzzling—not just to the Rossini-loving Viennese, but to nearly everyone. The Ninth was Beethoven’s final and grandest symphony. It fulfilled a lifelong ambition to set Schiller’s Ode: To Joy to music. The To Joy tune gestated within Beethoven throughout his lifetime. The whole of the third movement appears as a Utopian vision. Reveal difficulty and unresolved contradiction. The Ninth’s enormous scale relies on unresolved tensions developed early. The delayed resolution of these difficulties sustains the drama of the whole. 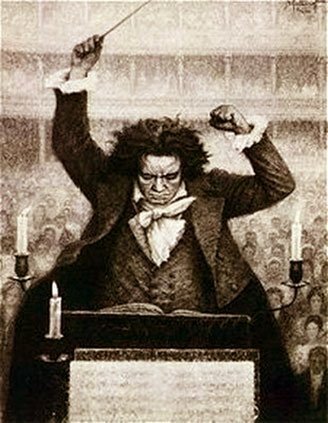 The return in the finale of themes from each of the first three movements suggests that Beethoven did not consider the musical arguments of the earlier movements resolved. Resist what is currently popular. Beethoven consistently rejected the Rossini craze. Are forerunners of what is to come. Symphonies of Schubert, Berlioz, Brahms, Mahler, Bruckner all consciously follow the Ninth. It is not an exaggeration to say that music of the 19th and 20th centuries is inconceivable without the Ninth. The second movement is a hybrid of scherzo, fugue, and sonata forms. The main theme is athletic and bracing, but its open intervals and minor mode echo the ominous character of the first movement. The central trio provides antic relief, and also one of the most challenging of the many tempo controversies surrounding the Ninth. Beethoven’s metronome indication—116 beats to the minute—seems equally ill-suited to the half-note as to the whole note. An examination of the manuscript shows that Beethoven himself changed his mind about which of those two note-values should be represented by the measure. The famous finale of the Ninth can be thought of as a four-movement symphony within a symphony. The first “movement” of it begins with Beethoven’s Schreckensfanfare—a Fanfare of Terror—that leads into a recitative for the cellos and basses alone. It is instrumental music that sounds as if it were the setting of a text, which, of course, it will soon become. There are brief recollections of themes from the previous three movements, until the woodwinds suggest a fourth option, the Ode: To Joy. That hymn-tune begins with utter serenity in the cellos and basses at first and without harmony, and then with ever-increasing adornment as other instruments join in. The Fanfare of Terror is heard once again, and then—for the first time in musical history—the human voice is heard in a symphonic setting. The words are Beethoven’s, not Schiller’s: “Oh friends, not these tones! Rather let us raise our voices with more pleasant and joyful sounds.” The Ode: To Joy pours forth once again with incomparable elation and optimism. The second “movement” of the finale is a grand march featuring the tenor soloist. It is in fact another variation of the To Joy theme. With the third section, we enter holy ground: “Do you kneel down, you millions? Do you sense your creator, world? Seek Him beyond the stars!” Here Beethoven reverts to a style that invokes the masters of sacred polyphony of an earlier age, music he had studied closely since 1812 at the time of his last symphony. Finally, the Ninth Symphony comes to a close in a series of musical paragraphs featuring the solo quartet and the chorus, with trumpets and horns at the conclusion blaring out the To Joy motive double-time. Christopher Wilkins was appointed Music Director of the Boston Landmarks Orchestra in the spring of 2011. Since then the orchestra has helped reaffirm founder Charles Ansbacher’s vision of making great music accessible to the whole community.